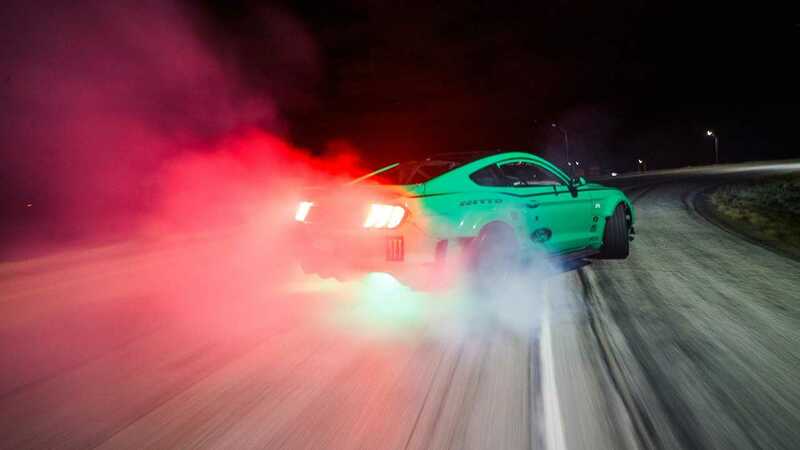 If you're looking for a two-minute reprieve from the stresses of life, turn off your brain and enjoy this video of Vaughn Gittin Jr. in his Ford Mustang RTR drifting around a cloverleaf interchange in Fort Worth, Texas. The filmmakers behind this clip do things right by not using extraneous music. Instead, viewers can focus on the angry sound that the engine makes and watch the smoke billowing from the rear tires. "Entering a cloverleaf at maximum attack is something I've always wanted to do! There was nothing like the sound of the 5.0 revving out under the overpass portion as it echoed every which way," Gittin Jr. said about the experience. "It was just the right amount of sketchiness and fun together... and quite a bit more challenging than I had expected linking it all together. And doing it at night made it that much more intense." With 900-horsepower on tap, Gittin Jr. has not problem making this Mustang RTR's tires spin. After a short runup, he enters the cloverleaf's long, sweeping corner and keeps the tail out the entire time. The rubber never stops smoking even as he exits the ramp, straightens out, and enters the next corner. Gittin Jr. then continues the stunt through two more sections of the cloverleaf, without ever letting off. His car control is quite something to behold. While you probably can't ever drive Gittin Jr.'s Mustang RTR in real life, if you have Forza Horizon 4 or Forza Motorsport 7, then it's now possible there to try drifting this muscle machine. Gittin Jr.'s drift weapon, his teammate's, and a road-legal Mustang RTR are part of the March updates for both games.